Shorebirds are nesting on our beaches, and in many areas we are already sharing the beach with tiny hatchlings. Many towns rope off nesting areas on the beach so shorebirds, who lay their eggs on the sand — in a little depression they create called a “scrape” –can have a safe place to raise their young undisturbed by human and domestic animal intrusions. Not only can you watch the birds from outside the ropes as they raise their babies, but it’s easy to have a good time at the beach while keeping nesting shorebirds safe. 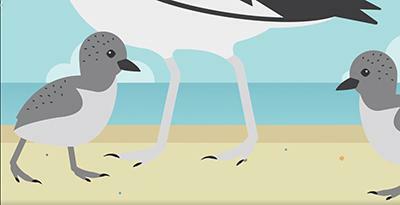 This wonderful video from South Carolina Audubon shows how birds nest on the beach and has some great suggestions for keeping them safe!